Full set of Layer 2+management features, including Static Routing, flexible fiber connectivity enabled through four combination Small Form-factor Pluggable (SFP)** gigabit interfaces, reliable performance backed by ProSafe Lifetime warranty. NETGEAR delivers wirespeed Gigabit performance and a full set of Layer 2 management features, as well as static routing with unsurpassed affordability. This next-generation, high-speed switch delivers maximum throughput where you need it - to high-performance workgroups at the edge of the network, or as a backbone for Fast Ethernet switches and high-speed servers in demanding small networks. The non-blocking design offers full Gigabit throughput simultaneously to all 24 or 48 10/100/1000 ports to ensure reliable performance. Flexible fiber connectivity is enabled through four combination small form-factor pluggable (SFP)** gigabit interfaces. Layer 2 management functionality delivers reliability, control, and availability. Static routing enables inter-VLAN routing and provides a faster network and more effective bandwidth management. Access control lists (L2-L4) provide robust security, while L2-L4 based QoS provides enhanced traffic management capabilities. 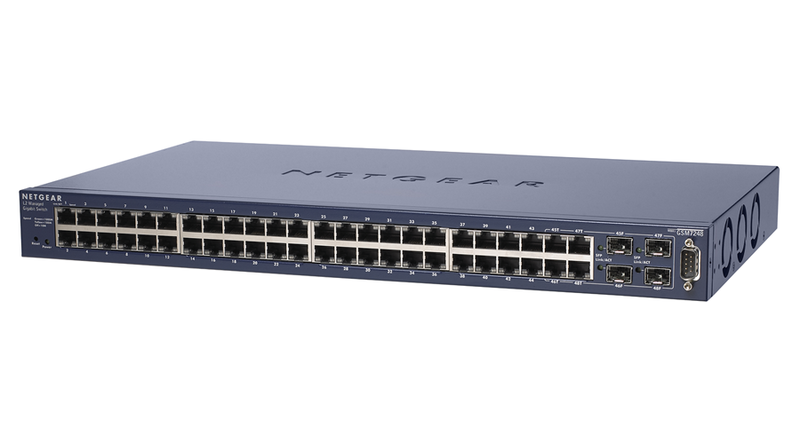 The cost-effective NETGEAR ProSafe 24- and 48-port Gigabit L2 Managed Switch creates a more productive - and future-proof - network. With increasing bandwidth requirements from applications such as voice, video, database management, and other services that slow throughput and response time, you can unleash your network and enable maximum productivity with Gigabit Ethernet for today's high-performance environments. Multiple NETGEAR fully managed switches can be managed via a single IP address. Optimize bandwidth, security, and control with full Layer 2 management capabilities. Network administrators can use any combination of these features to ensure uptime, availability, bandwidth and throughput. You must be logged in in order to view pricing. Copyright © 2019 NETXUSA, INC. All rights reserved.